Hello and welcome to Irish Experience Tours’ brand new travel blog! Right here you will find all the latest travel news, views and tips for exploring our great land, as well as all the information you need on the biggest and best adventure tours across the country. From the rugged beauty of the Wild Atlantic Way, through the rolling glens and valleys of our ancient lands, to the mountainous peaks that sweep down to the blue seas surrounding our little green island – we will take you on an unforgettable journey. Over the next few months we will bring you a selection of the very best that Ireland has to offer. Whether you are experienced explorers, adventure seekers, casual visitors, or a group of friends and family looking for an authentic Irish experience, we will take you by the hand and show you the real Ireland on a custom tour to suit your every need. Like our tours, our blog will bring you off the beaten track and down the road less travelled, so you can get the true Irish experience. We go where the locals go. Stick with Irish Experience Tours and you will never lose your way. With Halloween just around the corner, we at Irish Experience Tours want to share a peculiar, and completely true, story with our travel-loving friends. Before the date of 31st October was hijacked and commercialised to within an inch of its life, the beginning of November was traditionally an important part of the year. In the Irish language, November is called Samhain (pronounced Sow-Win), which traditionally marked the end of the harvests and the start of winter. The hours of daylight dwindled and the long, dark nights beckoned. Originally a pagan festival, people believed that it was this changing of the seasons that made it easier for people, and other beings, to pass between the lands of the living and the dead. 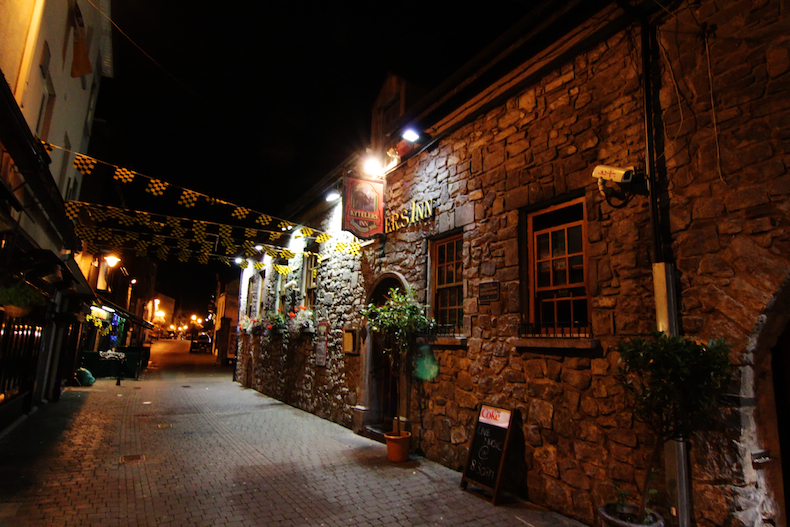 One such story begins in the ancient city of Kilkenny. There, a lady named Dame Alice Kyteler got into a wee bit of trouble. She was the first person in Ireland to be condemned for practising witchcraft. A variety of reasons conspired to convince the locals that she was a witch. Firstly, she was an outsider born to wealthy Flemish parents. The family was involved in money-lending, which may have been cause for jealousy and suspicion. She also had four husbands, two of whom died in mysterious circumstances. She and her second husband were accused of killing the first. The death of her fourth husband led to accusations of sorcery, and worse. It was said she had a sexual affair with a demon, sacrificed animals, and concocted foul potions involving boiling cockerels, spiders and worms in a pot with the head of a beheaded thief. All this was enough to suspect Dame Alice of witchcraft, and she was hunted…. but she escaped and fled Ireland. Unfortunately for her maid, a young lady named Petronilla de Meath, she was found to be guilty by association and was flogged and burned at the stake in the month of November 1324. Scary stuff indeed! You can learn more about Dame Alice, witchcraft in Ireland, and the ancient city of Kilkenny on our new small group adventure tours coming up in early 2018. Subscribe to our newsletter/blog to stay informed and we will keep you posted on the best tours Ireland has to offer. Experience the real Ireland and learn about real Irish history with Irish Experience Tours.